I had a great coupon from Staples in my inbox this morning. 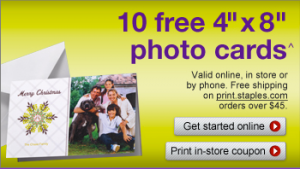 Get 10 FREE 4×8 Photo Cards with this coupon! Redeem in store to avoid shipping (which could cost as much as $9.99!) Coupon good through 11/12/11.